CREATIVE LATE BLOOMERS : DIANA ATHILL: "SUCCESS IN OLD AGE...A DELICIOUSLY SURPRISING TREAT"
DIANA ATHILL: "SUCCESS IN OLD AGE...A DELICIOUSLY SURPRISING TREAT"
Worried that your creative years are over? Sign up here for your regular dose of inspiration from Creative Late Bloomers who first found success in their 40s, 50s, 60s, 70s, 80s and even 90s. HER LATE-BLOOMING STORY: At age 83, Diana Athill published Stet, her reflections on more than 50 years working at Andre Deutsch Publishing in England, editing such literary giants as Philip Roth, Norman Mailer, John Updike, Jean Rhys, Simone de Beauvoir and Margaret Atwood. In 2002, at age 85, she published Yesterday Morning, a memoir about her very English childhood. The memoir, however, that brought her international fame was published when she was 91 years old: Somewhere Towards the End. That devastatingly honest and wry rumination on growing old won her the Costa Book Award and the National Book Critics Circle Award in 2008. 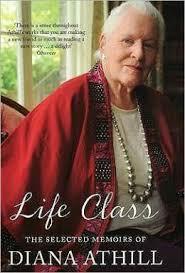 The next year Granta published Life Class: The Selected Memoirs of Diana Athill. In 2010 Athill was the subject of a BBC documentary, "Growing Old Disgracefully." Now living in a retirement home, the editor and writer still drives her car, writes essays for the Guardian and attends book festivals. NO ONE EVER SAID IT WOULD BE EASY: “From the age of 22 to that of about 39 I knew myself to be a failure,” Athill wrote this summer in the Guardian’s “Falling Short: Seven Writers Reflect on Failure.” Stunned after being rejected by the man she thought she was going to marry, Athill stumbled through her 20s and 30s with her sexual confidence in shatters. Then she discovered she could write. “It was the writing that really put an end to failure,” she says. Although success would allude her until her 70s, she continued to write: An Unavoidable Delay, a book of short stories, in 1962 at age 45; Instead of a Letter, a memoir in 1963 at age 46; Don't Look at Me Like That, a novel in 1967 at age 50; and two more memoirs -- After a Funeral and Make Believe -- in 1986 and 1993 at age 69 and age 75.